Here is a great site for language learning. It's LanguageGuide.org, which I found via one of Russell Stannard's great video tutorials. It's like an online pictorial dictionary, with audio support. There are several languages supported. My screen grab here is of the French page. 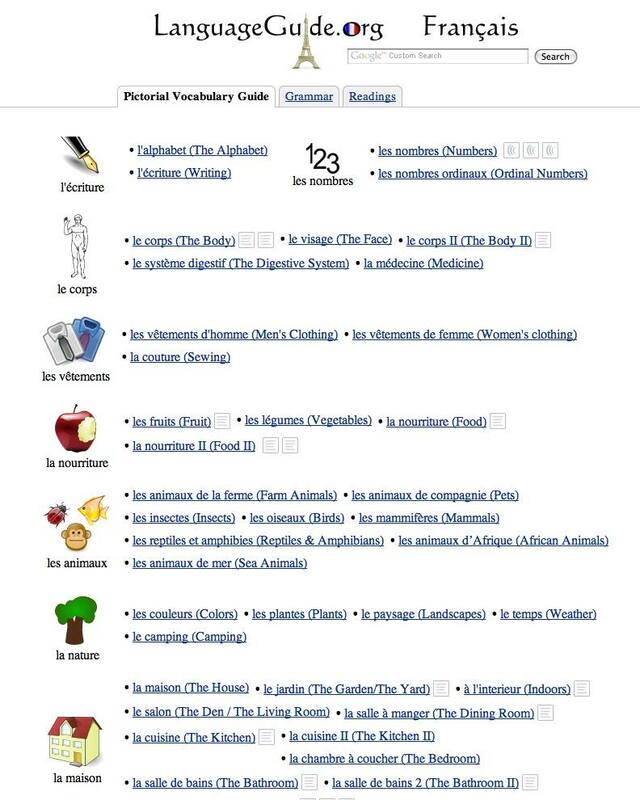 Lots of vocabulary topics are covered : the body, clothing, animals, the house etc. After you choose a topic, as you roll your cursor over an element, you hear it pronounced in the language you've chosen. 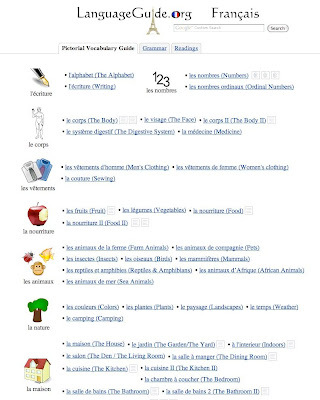 In French, there is also a grammar section and some readings. It really helps me as a student to listen and follow with my eyes, so I loved the readings. In my browser, there was no download or pause, a tiny mp3 player popped up and the voice started. I looked in the Spanish pages, but it only had a grammar section added to the pictorial vocabulary guide, so I suspect the site is a work in progress. If you're a student of another language, or you teach ESL/EFL, I think you'll enjoy LanguageGuide.org. More Chookly Goodness! Merci Beaucoup! For our holiday to Italy, we used: Italian for Children (Language for Children Series) (Mixed media product) by Catherine Bruzzone. It is so lovely for kids to speak a few new words. Just ordering an ice-cream and being able to say 'thank-you' makes them proudly glow. I think that's an excellent point, Paula. Even if our kids can't learn a language right now, they can probably pick up some useful phrases and learn about different cultures. Thanks for this. Was just reading about how Zoe is raising her children bilingually and how I really hope I can learn a second language with my own son. This could be a good resource to inspire us. I'll keep an eye open for more language resources for you, Ian. If you let me know when you choose a language, I'll start collecting resources as I come across them.